ps: When I use the word “spice”, it’s not like “They added an item song to spice the movie up”. It’s more like “They used modern technology as one would use a fluorescent marker, to reinforce and highlight the the relevance of ancient traditions”. I Indian Weddings are the very much flower liking. Elderly folks at weddings are usually handed flowers which they go on to bless and then exercise their rotator cuff muscles to hurl aforementioned plant reproductive parts in the hope that the blessed object will make contact with the couple seated on the medai and initiate a benediction transfer process. 1. Only the front row (often occupied by the oldest of the old) has a reasonable chance of ensuring that their blessings reach the couple. The ones behind can do no better than throw flowers on the people immediately in front of them (because of 1) poor throwing arms 2) air friction). This means that there is a very inefficient transfer of benediction to the couple. Random people in the crowd are getting blessed while the couple is being short-changed. In this tough world of work pressures, bad software and T-Nagar shopping megamalls, couples need every flower to make direct contact with their heads. There are thousands of cannons lying around in museums, gathering rust and dust. And on top of that, their minds are wracked with the guilt of all the death and destruction they have caused in the past. So why not give them a new lease of life and chance to dole out something positive? Every wedding has a designated Gift Collector (usually a close cousin) who is in charge of collecting, documenting and accounting for all presents, both cash and kind. 2. The gift collector can do nothing about those lazy attendees who recycle the same tea set/cutlery set that they received at their (or their children’s) wedding. 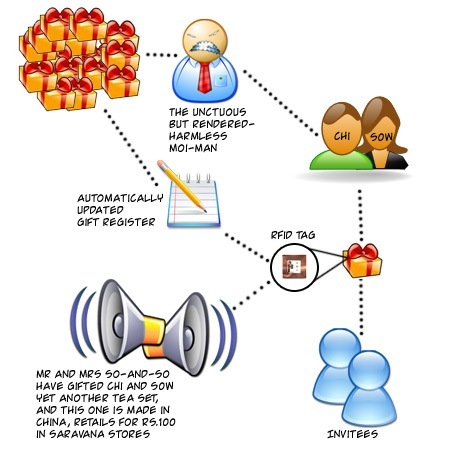 RFID tags can be used to identify and track gifts. So a small loudspeaker system that announces “Mr and Mrs So-and-So have gifted yet another tea set” should discourage people from being lazy gifters in the future. ps: Moi-Man is a Tamizh term referring to the person who is in charge of keeping gift records. 1. One miniature coconut that, after the fibrous skin is removed, has about a table-tennis ball size worth of actual usable material. 2. One sweet lime with skin that is as difficult to remove as a burkha in Saudi Arabia. 3. One mouth-cancer causing packet of betel nut pieces mixed with industrial chemicals. 3. Small packet with cloves and elaichi instead of betel nuts. There are several things one could do to reduce the carbon footprint of our weddings. 1. As already mentioned, Jute and paper bags instead of plastic. Paper cups for filter coffee and water. 2. Recycle wasted food. A huge amount of food gets wasted at every wedding. And the solution for that is – Cows. All Kalyaana Mandapams must maintain some cows so that weddings can save a lot on fuel and milk costs. 3. An insane amount of jewellery is usually on display. So I think solar panels that can trap all this jigna and generate electricity will help cut energy costs. 4. Wedding halls should provide absolutely no parking space, so that it will force people to use public transport. My amateur musician heart goes out to all the Nadaswaram and Thavil brothers who are cruelly mistreated and their music blatantly disrespected at every Tambram wedding. They are all too frequently interrupted and asked, willy-nilly, to stop their passionate alapana in Thodi and instead, play an unmusical stream of noise called Getty Melam. 2. Drowning out any inauspicious sounds that may be emanating from the audience. Why interrupt a musician’s flow when the Bose G1000 “Getty Monster” amplifier/speaker can be used to generate 100 dB attention gathering getty melam sounds. Many thousands of rupees are wasted on capturing a video of the marriage proceedings. Not only do these guys only capture the most boring and insipid moments (It’s hard to get invitees to be spontaneous with the equivalent of a solar flare in ones face), they are also rather immobile, what with miles of wire trailing them and a camera the size of a bazooka. Honestly, how many times does a wedding video ever get watched? Once? Here is my suggestion. Get 10 of your friends to roam around with their 3 megapixel camera phones and shoot several interesting snippets from the entire wedding. Apart from 2 or 3 angles focussing just on the main event, others can focus on the canteen, where one can catch little kids struggling to stop runny rasam from leaking over the edge of the table and soiling their brand new miniature sherwaanis. Some can be deputed to focus only on the parents of the bride and groom and capture their faces go through a gamut of emotions ranging from frustration, joy, rage and relief throughout the day. And others can point their camera phones occasionally at the kitchen, capturing the caffeine addict maama demanding coffee with extra decoction directly from the chef. In the end, one will end up with several short, highly watchable, youtube style videos that could even be posted online for non-attendees to watch in the comfort of their home. It is estimated that about 70% of elapsed time in a Tambram wedding goes in the bride changing 7 sarees during the day. Well, RMKV and Kumaran have already come up with path breaking innovations such as 4-in-1 and Zip-pallu sarees, so why not just come up with a 6-in-1 Kalyaanamegasaree that can morph from a breezy Oonjal saree to orthodox Madisaaru followed by homely Grihapravesham to chilled-out Nalangu, an ubergrand reception and a cheevidunga first night saree? And since time = money and money = paper and paper = trees and all that, I think RMKV and Kumaran need to make this happen now if we are to have a chance of saving our forests. 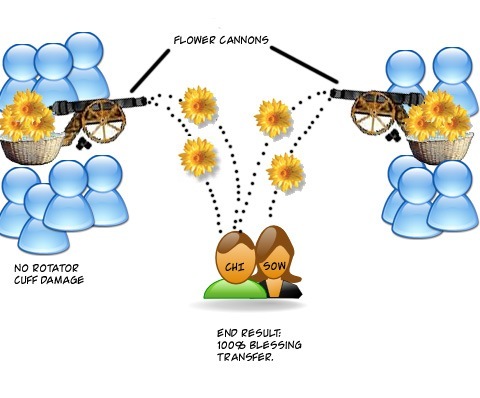 Flower cannons: wasn’t the torture of sitting for hours and getting holy smoke into your lungs enough? with RFIDs you don’t need a moi-man as they parcels are all tagged and can be stashed. That deprives us of jollu-vidifying! are usb drives that cheap now? damn! I gotta ask my dad to fedex em instead of queuing up outside bestbuy. totally agree on the cows and moosik. But then that robs the vadiyar of his most famous line ‘getty malam, getty malam’ which is ofcourse followed by ‘mangalyam….’. the vadiyar association will surely object to this. prefer to stay away from the pattu-podavai section as the last thing i want is angry maamis spitting fire….. But there still isn’t any way to banish those long lines at the reception. There must be a new technological solution to meet the couple on stage; better still, off stage. Maybe Darth Vaadhiyar can also come up with some innovative ways to do a ‘express wedding’. I would have loved a paypal/gift registry alternative to rfid. you are too wedded to the process and not the intent. I’m scared to ask this question, but what is a a cheevidunga first night saree? Hi Krish..i am ur blog’s new visitor.. u r damn cool.. keep the gud work goin.. & btw whts -“Tambram wedding ” ? You forgot those annoying wall clocks and alarm pieces. I would certainly attend every marriage if they follow your suggestion and give 2GB thumb drives. Yet another boring thing that needs modernization is .. going and meeting bride and groom on the dais and giving a pose for Camera guy faking smile. Last but not least …. All those aunties and uncles asking you whether you remember them or not and those old grannies asking when am I going to serve sambar-rice/pappu-rice. As if getting married itself isnt akin to being cannon fodder, you want to take literal interpration to new heights. I had good laugh imagining what would happen if all the flowers did actually reach the stage/podium. It’ll be like that Alaigal Oivathillai song (Aayiram Thaamarai Mottukalae ?) , except the underneath the flowers there will be madisaars and panjagachams. I liked the environment friendly ideas…but do u think a 2 gb flash memory is recyclable? The one (non-brahmin) wedding I attended in a village went straight to the root of the matter. None of your fancy wall clocks and Thanjavur metal inlay gopurams there. It was straight cash-and the moyy-man (very saary-the moi is too French for me) declared the amount into a megaphone-Sendhalai Karuppusamy-200 rooba-reNdu kaal! The reNdu kaal was most illustrative. Evidently a sliding scale was used. Jujube 50 rooba moyy-ezhudharavanga didnt get a chicken leg (kaal), 100 rooba-s got 1 leg and so forth! Oh you’ve come up with a smash hit again! the video guy is my biggest grouse….his main job seems to be videotaping guests while they are busy chomping away unaware that their open mouths are being filmed for posterity…. One of these days I’ll die laughing over your blog. Must remember to keep a note, absolving you, around! Earlier at the wedding only cash was given and they used to announce in the mike as “madurai senthil pillai ruba 20, selaiyur chokkalingam ruba10 ” etc. To avoid such embarassing situations all these jigina papered , recycled items came into existance. Another embarassing thing is waiting in front of people who are eating and are expected to finish to occupy the seat. I think buffet systems for the reception can be extended for the wedding session also to avoid standing in front of people who are eating and making them deprive some of their eating. I suggest that flowers for blessing the couple can be given to all the people and collect it in a box with their blessings and one or two persons can go to the dais and shower on the couple. I saw a different system in coimbatore. Above the couples head on the ceiling a box full of flowers was kept and it was electrically operated to open and close at intervals to shower the flowers. In karnataka and mangalore the usage of yellow coloured rice was very huge instead of flowers during the wedding and there they used to collect the same in a bowl and it will be given to the poor . For your information madisar is 9 yards and the other sarees are 6 yards. Hence minimum 2 sarees. Do u have any idea for the most straining and eye burning ritual – Homam – which the bride and bridegroom undergo? Most imp – we spend so much for the parlour lady and everythnng goes off in tears nd wipping….. :(:(:( alas even b4 every1 sees the bride….. Totally insane, man! RFID tags and money being diverted to Swiss accounts! I completely agree with the videography points. People are all talking normally until the camera guy appears. And then suddenly everything is quiet, and everyone is self consciously staring at the camera or somewhere else while the camera lights give them burnt and blinded. KBS, perhaps the homan smoke could be water filtered? “Elderly folks at weddings are usually handed flowers which they go on to bless and then exercise their rotator cuff muscles to hurl aforementioned plant reproductive parts in the hope that the blessed object will make contact with the couple seated on the medai and initiate a benediction transfer process.” What a way to put it! Simply Ingenious! the whole self conscious thing is quite contrary to how people behave when a TV/local news/stingop cams(!) are out on the streets interviewing some random junta, everybody just wants to have their piece of the TV screen pixel. why then do they all go mum at a wedding? 🙂 Wonderful post…loved the vethalai pakku idea …. if i die choking on this club soda that I am parundhing… you will be held directly responsible… people will want your autograph! 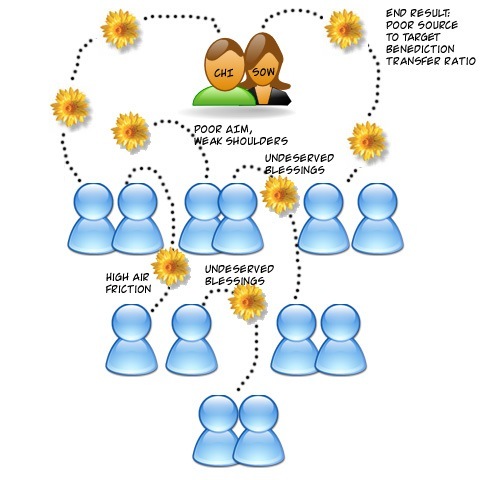 We are talking about a green wedding and you are talking about the source for 5% of global warming gases! And that is a no-no! If at all any cows are present in a kalyana mandapams, the said facility has to issue an undertaking that the above mentioned quad-tummied farters are fed with methane suppressing food supplements mixed with the thavudu and punnaku. Else, kalyana mandapams should purchase carbon offsets instead to compensate for the greenhouse gas emissions. Another hilarious post! 🙂 Thanks for the entertainment! The homam must be replaced by an electric blue-flame fire.. running on batteries.. now theres an environment friendly entrepreneurship idea! it has its ingredients to make good for your health. Author thaan TamBram kalachaaratha “total damage” panninaan nenacha, indha comments podaravaalum innum galeej panni vittutaanga. Honestly, they have’nt missed out any damn thing in the wedding for me to give vent to my creativity to. Me thinks, something must be done regarding the whole Oonjal and the Paalum and Pazhamum thingie. That in itself is a hilarious chadangu, wonder what can be done to make it funnier. Pingback: Within / Without » LOL! hilarious, as usual 😀 how about some automation in handing over the thaamboola pai — a saree-draped robot, maybe? LOL..had to control my laughter lest my officemates think I am crazy..dropped here from Laksh’s page…goood one..
That whole maapla ponnu standing on the ‘stage’ thing should be banned. Avangale edho accused maari anga nindhindrupaaanga, avangaloda photo edukardhukku oru queue vera. Kevalama irukku. Instead they should mingle along with the guests or something. holy crap that was funny. I found you through sepia mutiny, and i will be back! hilarious post btw. what about the constant falling at the feet of elders during the ceremony? can that be optimized? i also dont like the bit where the bride’s parents have to kowtow before the groom’s parents. and the bride’s father having to wash the groom’s feet. now don’t get me started on that. The ‘Manjal paii’ thamboola bag should be resurrected. Eco friendly and lasts a loooong time. Maybe longer than some marriages ! Some years back , people tried the idea of the bride-bridegroom mingling with the crowd but gave it up. Some invitees cornered extra time and many others got left out in the crowd. This is hilarious. Did you come up with all those diagrams yourself??? man, you made my day! just saw your post thanks to ultrabrown and within/without and i’m glad i checked it out. eagerly waiting for wedding 2.0! ..and i love the illustrations!!! Awesome! What is the minimum budget to implement wedding 2.0? Hahahahaha! I cant stop laughing! I stumbled upon your blog quite by chance, and I’m so glad I did!!! Thta was hilarious!! Rofl rofl rofl..
the only thing i can think of at the end of the post is that i would like to see a post about your experiences in how hard it is to remove burkhas in saudi arabia. That RFID bit is real hilarious..very nice post Krish. A tip from me.. Post lunch session shall have inhouse Suyamvaram where propsective brides and grooms are introduced to the network. A post like this is highly intimidating to an ordinary commenter. The pressure to fashion a comment that at least marginally approaches the brilliance of the post is immense. Awesome writing dude.It was hilarious all the way.. Man!! that was hilarious. I liked giving away the 2 GB flash drive idea..
Parava-Illay! Nalla analysis! Manday Irukku! Brilliant work Ashok. My niece forwarded it to me. And she is getting married shortly. I am already spending time at the bench press – getting prepared to carry her and run. With all the crowd around, it will be like robbing a bank on Ranganathan street and hoping to get away. I liked the Getty Mayhem the best ( and Chandra’s observation of counter clockwise – I don’t have the patience to type out “apradhatshinamaannaa” ). It is best to give the remote to the Vadhiyaar ( who anyway controls everything). 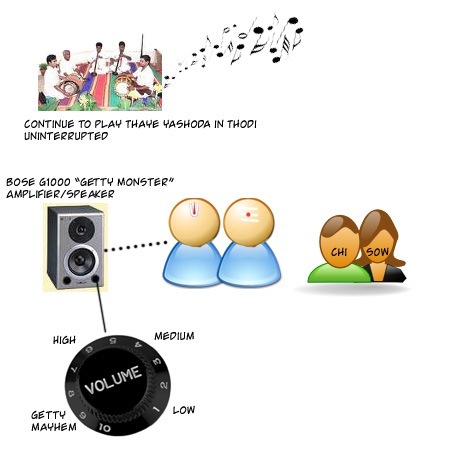 Or maybe the Vadhiyaars can have the Getty Melam as a ringtone and have it Bluetooth syched with your Getty Monster. Incidentally, in that scene, why is an Iyer getting married to an Iyengar – direction mistake – ah illa intentional -ah ? As for your description of blessing with flowers – I am not sure if you sound like PGW or Peter Sellers in The Party. It was brilliant. How about supplying blowpipes used for blowing darts – ana adhu echchael. How about paint ball guns instead of cannons – more portable. The contractor will arrange for all of that I guess. My problem over the years have been the sarees. Why bother buying them all ? Why not just have a lending library kind of system ? Raviraj or Easwari can be contacted for technical knowhow. There is some much of unused inventory lying around. As for video, great suggestion. But if we do not have the time to watch it even once, who is going to sit and edit the shots from different cameras and mix them ??? As for moi or moyy – whatever, why not simply swipe our Credit cards. 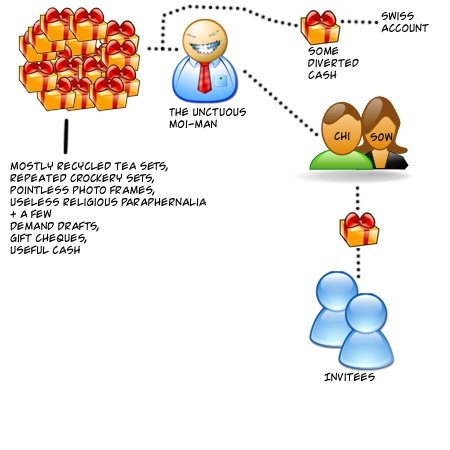 It can be connected to the same Getty Monster which can yell out your name, amount gifted, currency, equivalent in INR etc. What are your thoughts on the Reception Kacheri – where the singer is only one on stage singing while all others are oblivious to her presence ? Absolutely Awesome. Keep up the good work. Awesome presentation Ashok! Keep it up! As and when the invitee enters the marriage hall he /she picks up her name embedded paper cups (2) for coffee & water to increase number of trees saved. ps : Krish From TCS if I m not mistaken ? I never imagined a TABRAM marriage can be made so hilarious. If you enjoyed this blog, you will also like “Washingtonil Thirumanam” by Savi. 1 kalyana saree a – that must have made your wife frown. whoa..that seems a lot of process engineering on the occasion called marriage..
i see an advantage with the mms photographers..a lot of prospective brides would make it to album..
also the “nalang”..could be have improvements..paint ball, lazer gun could make it to the arena..
tht was really too gud….nd the comments made by people evn better….evvalavu idea vechikeengale neenga idea maniya???? Good Post man… Good thinking.. had fun…. For the people who attend the wedding from previous day – especially when it comes to sleeping – there is lots of issues w.r.t. number of beds and pillows available. And most of them are given away to the groom’s side at times… something has to be done about the logistics part of this issue… Any technical solution for that? Well, I am going to employ every one of these techniques in my wedding..er. Maybe Ill remain a bachelor for life. someone should definitely start implementing it…..
That is probably the best post a tambram mind could come up with!! have tears in my eyes, laughing like a moron in the office! 🙂 Please don’t stop writing! Great Post KA . You forgot to mention abt the Scent Sprayer which usually is modelled like Laughing Buddha Holding A Disc above his head which is supposed to spray panneer over the visitors . It left me nauseous is many weddings . Should find a solution for it 😛 . Brilliant post! Your articles are always a pleasure to read. Keep it going, Ashok! anna! even i agree with your nadaswaram interruption part of it. very true indeed. re-cycling the waste food is terrific concept but now a days with the shooting prices of basic commodities, i think we need to pass a bill in state to make cow shed with cows compulsary in all major mandapams ..
What an awesome post! I discovered your blog a month ago and have since become a loyal fan and follower. 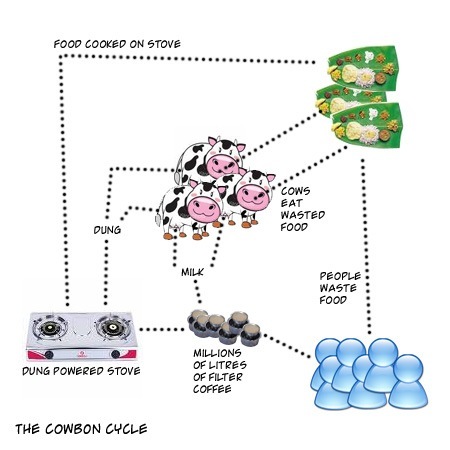 Love the Green Wedding ideas, and the Cowbon Cycle graph is too wonderful for words. Simply super! N hésitez pas a partager cette article. Il en vaut vraiment le coup. Je vous remercie une fois de plus. bonne continuation. J’aimerai collecter quelques avis sur ces informations. Une super technique en SEO est de demander une formation de référencement SEO avant de confier la prestation de référencement internet à un freelance seo. Vous en sortirez compétents à encadrer et appréhender de nouvelles méthodes SEO. Qu’en pensez-vous ? It’s nearly impossible to find experienced people for this topic, however, you seem like you know what you’re talking about!